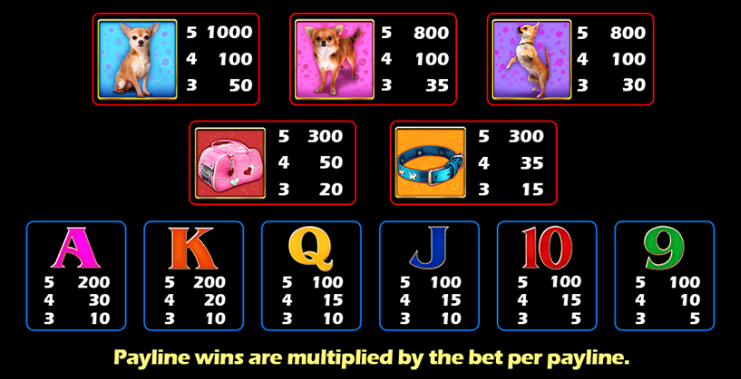 Cute canines are the theme of this online slot machine from Shanghai-based Aspect Gaming; it’s called Doggone Lucky and as well as offering some furry free spins it allows players to pick their favourite dog as the scatter symbol. 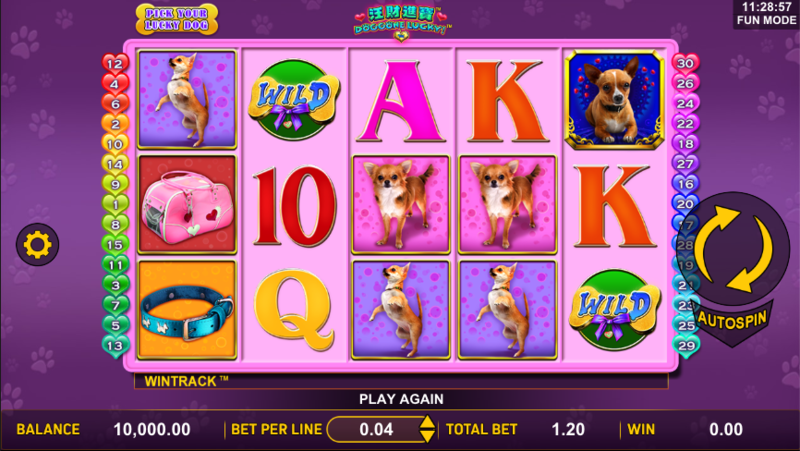 Doggone Lucky is a five reel slot with three rows and thirty fixed paylines; pink and pastel colours provide the atmosphere while colourful hearts displaying the paylines steal the show on either side of the reels. Click the ‘Pick Your Lucky Dog’ bone above the reels, select a dog and the higher value symbols will be that dog in three positions, along with a collar and a case – a fourth position will also represent the scatter symbol. 9, 10, J, Q, K and A are the lower values. A huge bone is wild, it appears only on reels two to five and it will replace all other symbols to help form winning combos except for the doggy scatter of your choosing. This is triggered by landing three of the scatter symbols anywhere on reels one, three and five; you’ll now receive ten free spins but during this round all the high value symbols plus the wild can appear as double symbols, meaning that winning combos of up to ten can be formed with a maximum payout of 1500x the line bet. Three more scatters will award five extra spins but only once – after that you’ll receive the normal scatter payout of 5x the total bet. If you like dogs and pastel colours then there’s really nothing to dislike about a slot like Doggone Lucky; we like the ability to pick your favourite dog and there seems to be some winning potential with the double symbols in the free spins. The RTP is 94.01%.